A new international study¹ revealed that a third of consumers are now choosing to buy from brands they believe are doing social or environmental good, and more than one in five respondents said they would actively choose a brand if it made their sustainability credentials clearer on its packaging and in its marketing. This represents a potential untapped opportunity of €966 billion out of a €2.5 trillion total market for sustainable goods. Ahead of his presentation entitled ‘Sustainovations in FMCG: Merging sustainable development with consumer insights’ at CIEX 2017 in Frankfurt on September 19th, we spoke to Dr. Thomas Foerster, Henkel’s Corporate Vice President of R&D for Beauty Care. Dr. Foerster believes that sustainability is becoming one of the most important drivers for innovation. In 2016, Henkel employed around 2,700 people on average in R&D and invested €463 million in R&D activities. When asked about the importance of employees and cooperations for innovation, Dr. Foerster explained: “Innovation is at the heart of R&D – and probably the strongest growth driver for the business. So, it is our number 1 priority. But innovation is the responsibility of all employees. And very often teamwork and cooperation is needed to come to brighter ideas and faster developments”. At Henkel, sustainability is a required element of the innovation process and is continuously reviewed. The Beauty Care business unit has linked this goal strategically to its innovative strength. As a result, every new product makes a positive contribution to at least one of six focal areas identified by Henkel, and impacts at least one stage of the value chain. The strategic goal of sustainability combined with innovative strength sets Henkel Beauty Care apart from its competitors. The focus is on innovations that will help customers and consumers to reduce their energy use and thereby their own carbon footprint. Since 2011, Henkel has reduced the CO2 footprint of its raw materials by an average of 4 percent per year, relative to total sales. By using readily biodegradable raw materials the company also reduces wastewater pollution. Henkel’s aim is to save 50 million metric tons of CO2 emissions by 2020. Henkel products are both innovative and sustainable in terms of raw materials, formulation and use – which forms the basis of the sustainovations concept. The comprehensive integration of raw material data into the development process has enabled the company to determine the CO2 footprint of over 165,000 product formulas. Based on the success of the raw material-based method, a comparable application is now being introduced for all packaging materials. The application, which is in the development stage, aims to help reduce the environmental footprint of cosmetics packaging and make it fully transparent as of 2017. Dr. Foerster says that there is definitely no linear correlation between R&D expenditure and new developments. He continues: “You have to spend your money in an efficient – but even more important – efficacious way, betting on the right horse. It is well known that the innovation pipeline is more an innovation funnel. At the fuzzy front end you need enough input so that you get a constant flux of consumer relevant innovations out of the process”. In order to keep innovation and R&D pipeline healthy, Henkel manages 2 stage-gate processes; one for the mid-to-longterm advanced research, one for the launch initiatives. “Our focus has been more on product innovations; however, processes and services are becoming more important, especially in the digital world” he adds. Henkel collaborates closely with its strategic suppliers to fully exploit its innovative potential and ensure the procurement of smart, sustainable raw materials. A number of awards help to recognize these efforts and to motivate suppliers. 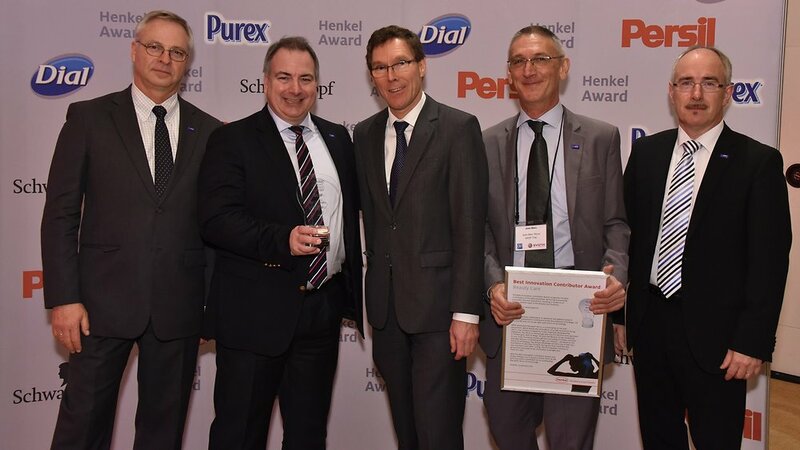 Henkel’s Adhesive Technologies business unit presented its sustainability award in 2016 to Evonik Resource Efficiency GmbH for its ongoing contribution to the sustainability of the product and project pipeline at Henkel. The Beauty Care business unit recognized chemical company Lonza in 2016. A collaboration with Lonza resulted in the development of more environmentally compatible ingredients for Dial brand antibacterial soaps. The Laundry & Home Care business unit presented BASF with an award in 2016 for the development of unique, high-performance ingredients that have gone into the development of phosphate-free automatic dishwashing products. As a result, Henkel premium brand Somat now contributes to a reduction in water pollution. Given the outlook of chemicals industry and global mega-trends, Dr. Foerster says they are working with their marketing colleagues looking for evolving market trends, but of course also to upcoming technological trends: “We try to match them and validate our concepts with consumers to make our customers the centre of our innovation efforts”. Along with Henkel, several international brands such as P&G, PepsiCo, BMW, Oriflame are confirmed to speak at CIEX. Together with leading specialty chemical manufacturers, they will explore innovation strategies and processes across the chemical value chain. CIEX 2017 – The Chemical Innovation Exchange – will take place at the Jumeirah Frankfurt on September 19&20. See full details at ciex-eu.org.